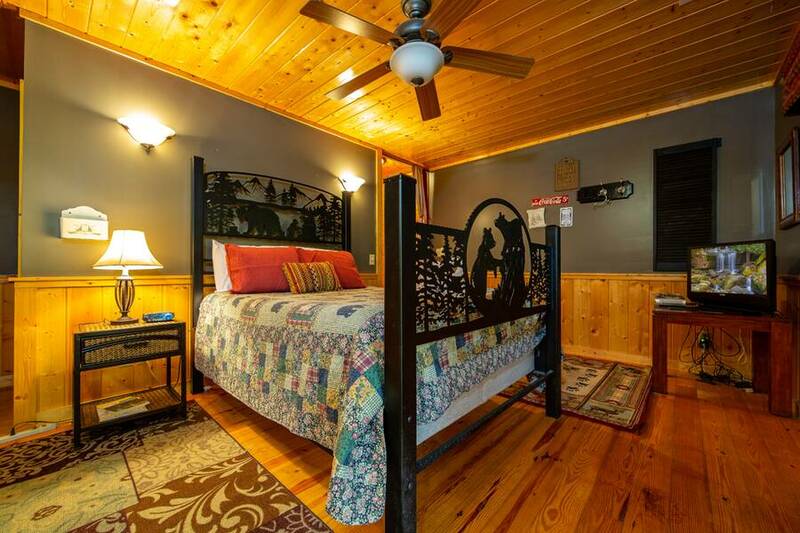 Welcome to Lucky 7 Bear Lodge in Pigeon Forge! 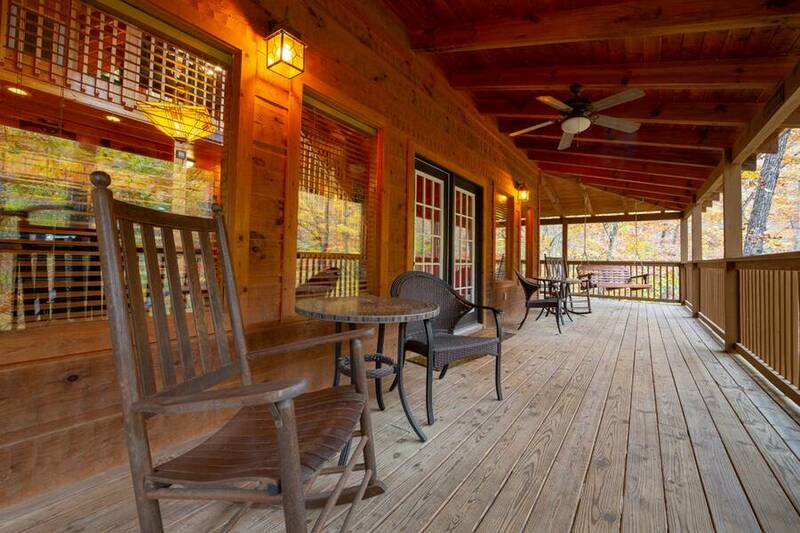 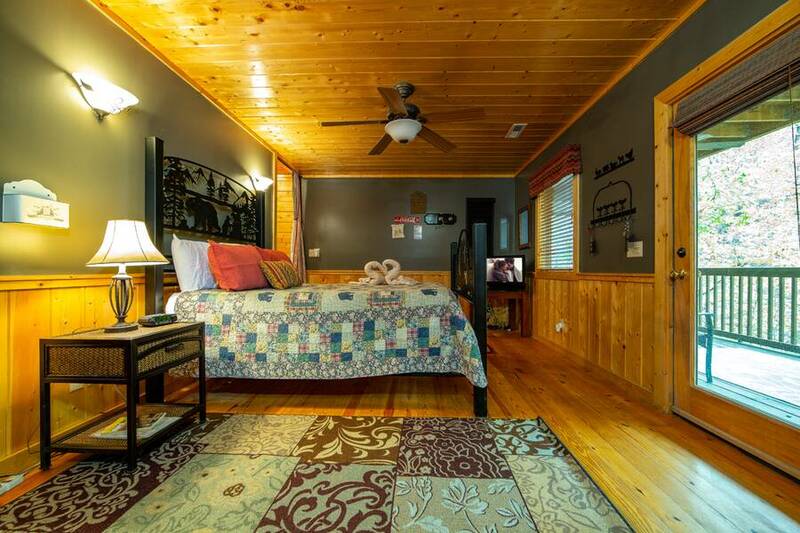 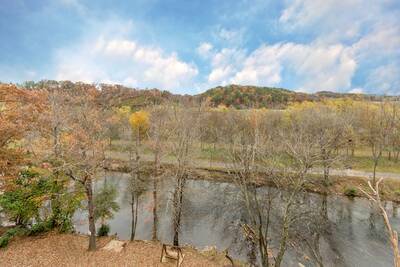 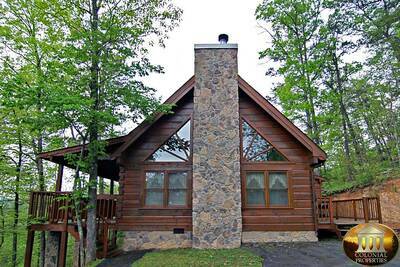 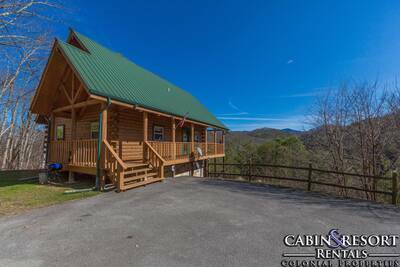 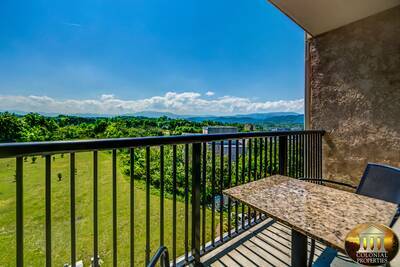 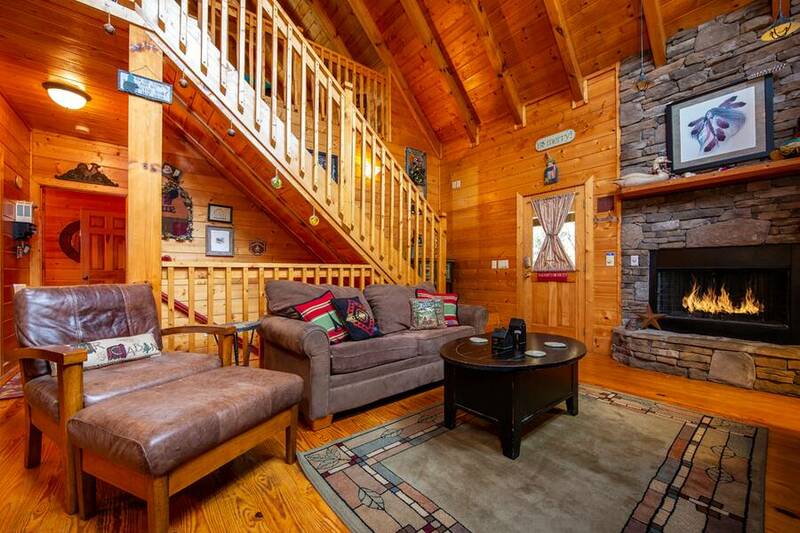 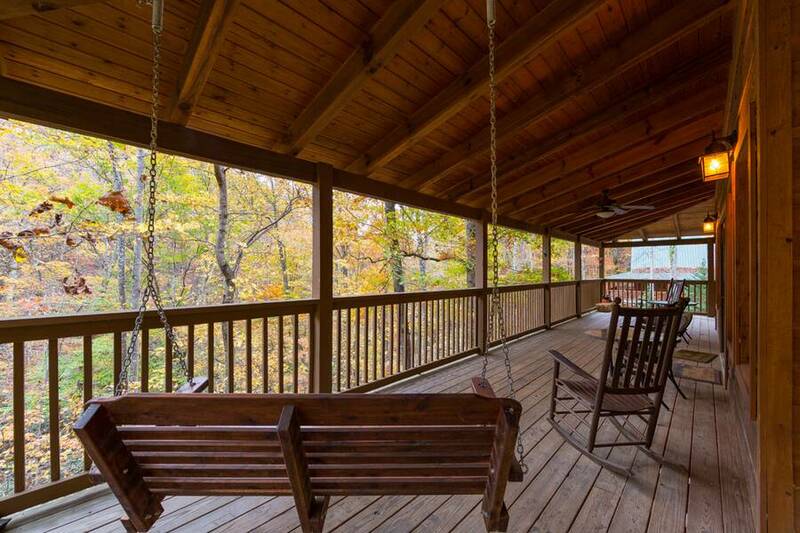 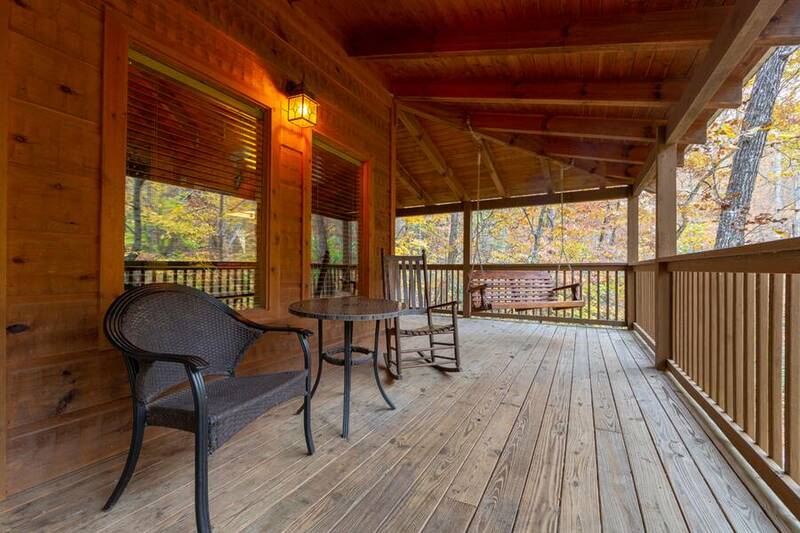 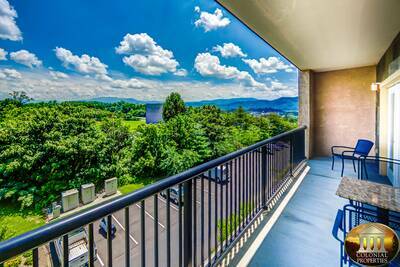 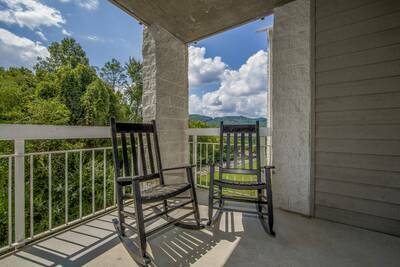 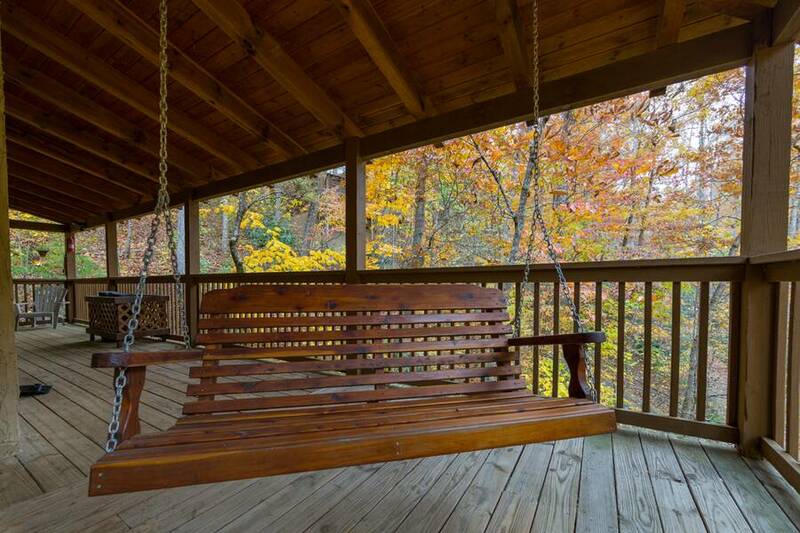 This 2 bedroom, 2 bath Smoky Mountain cabin rental provides you and your guests with a serene, park-like setting to truly experience the beauty of the Smokies. 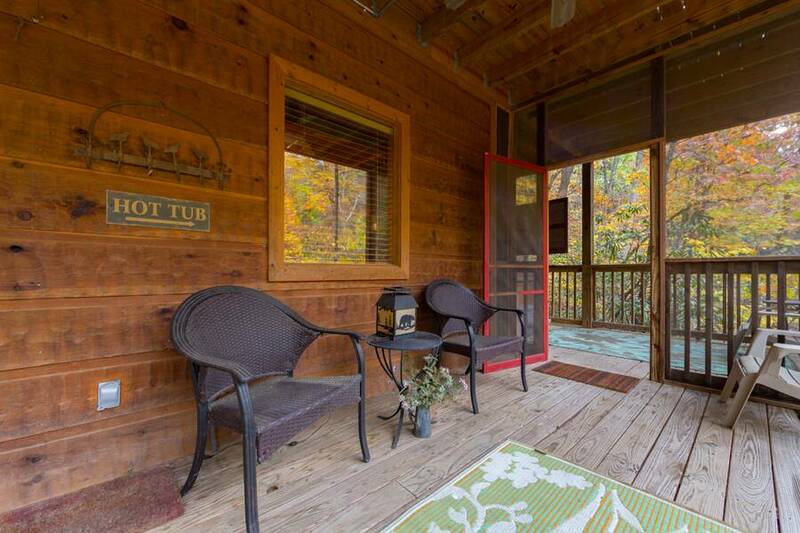 Tucked away amongst lush foliage, you’ll love the sounds of nature that abound at this cabin getaway. 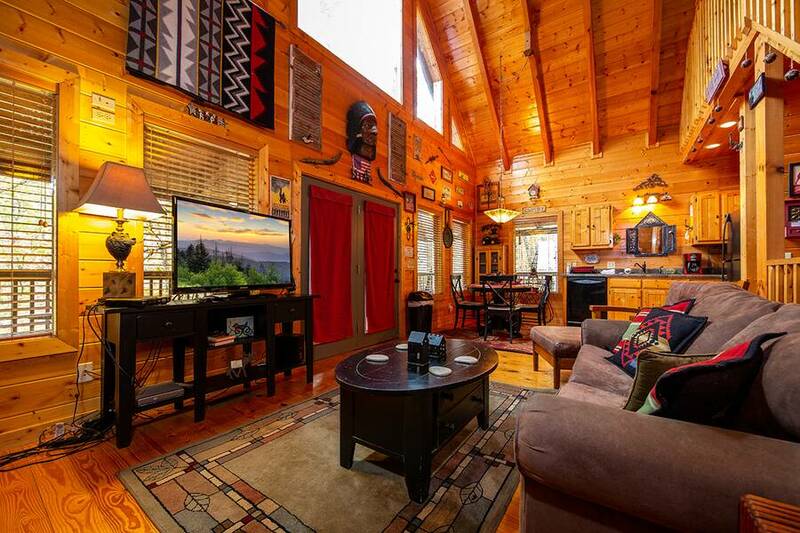 Step inside the living area and you’re immediately greeted by soothing natural wood tones and eclectic mountain themed décor. 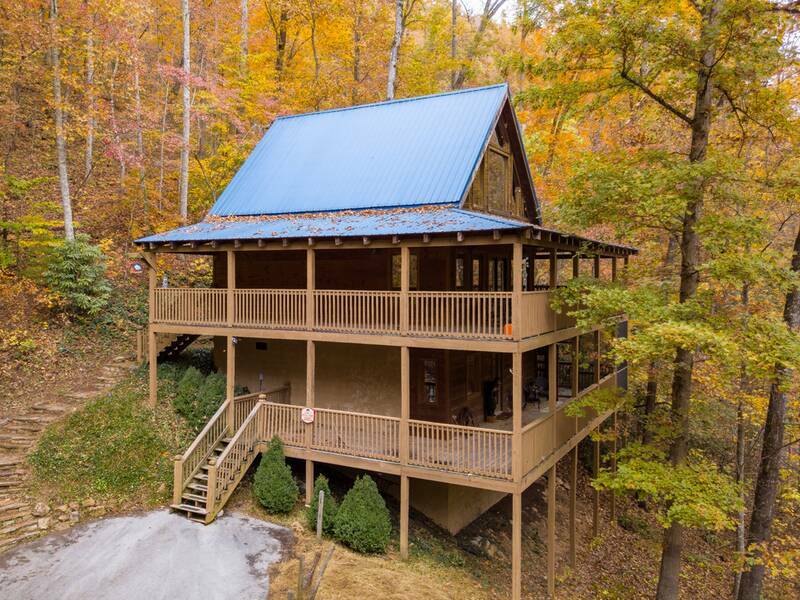 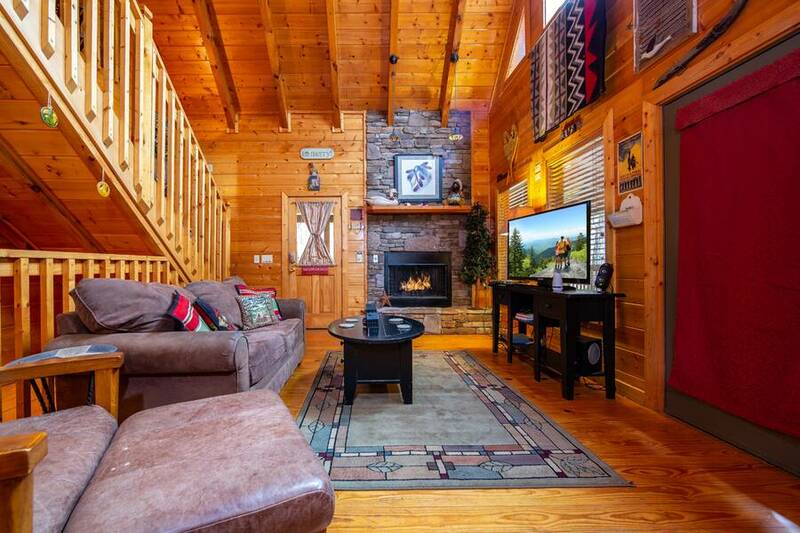 Cozy up next to the fireplace, watch your favorite movies on the flat screen, step outside onto the wrap around covered deck, or just kick back and enjoy your time in the Smoky Mountains. 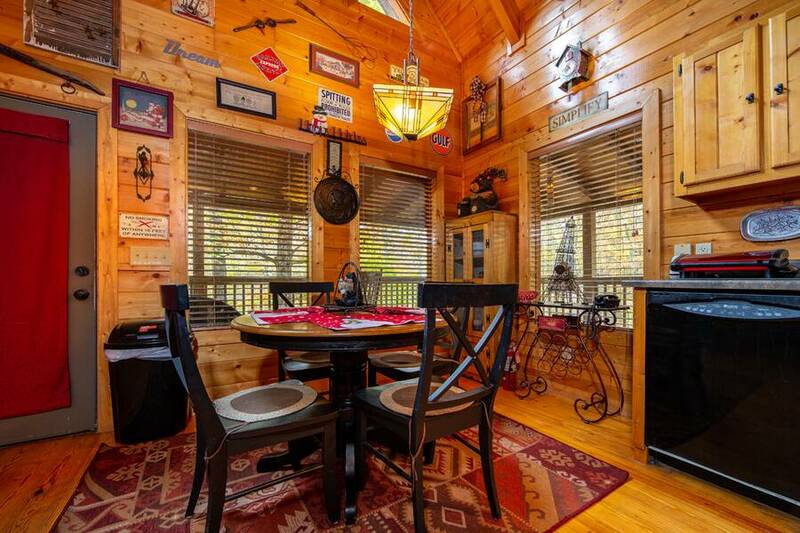 Adjoining the living room is the fully equipped kitchen and dining area. 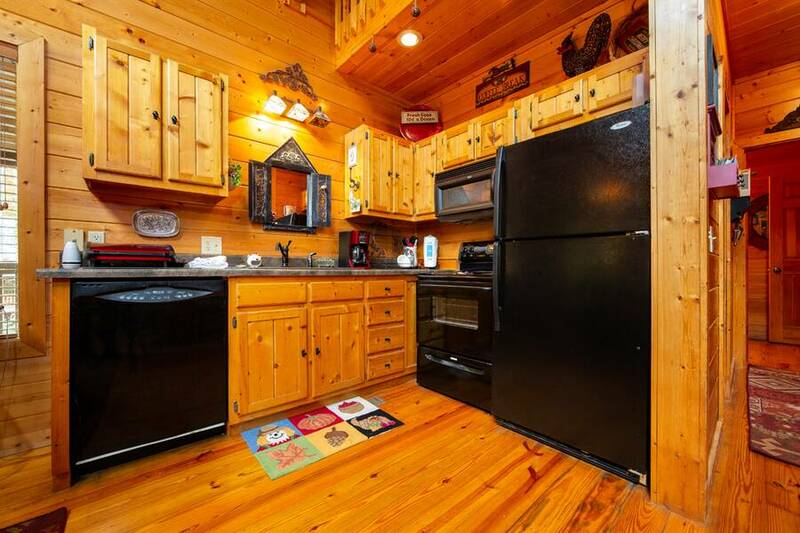 Here, you’ll have the ability to prepare, cook and serve your favorite meals while vacationing at Lucky 7. 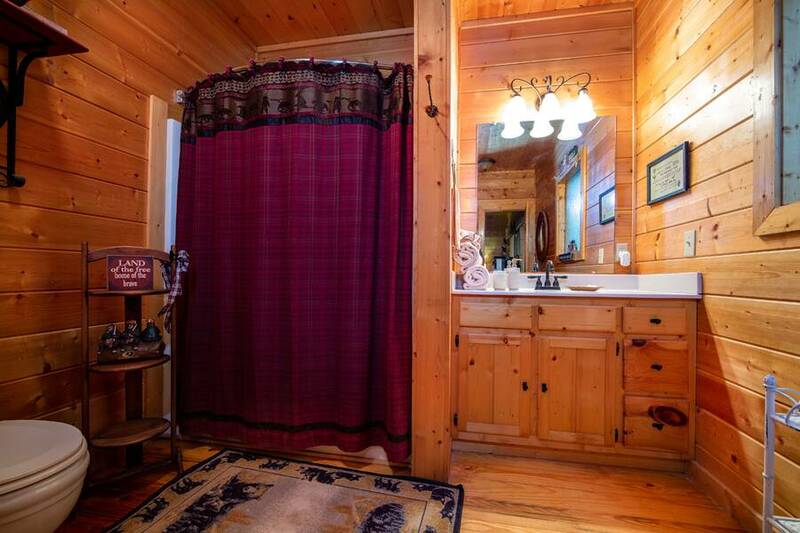 Located on the main level is a bedroom with an attached full bath for added privacy and convenience. 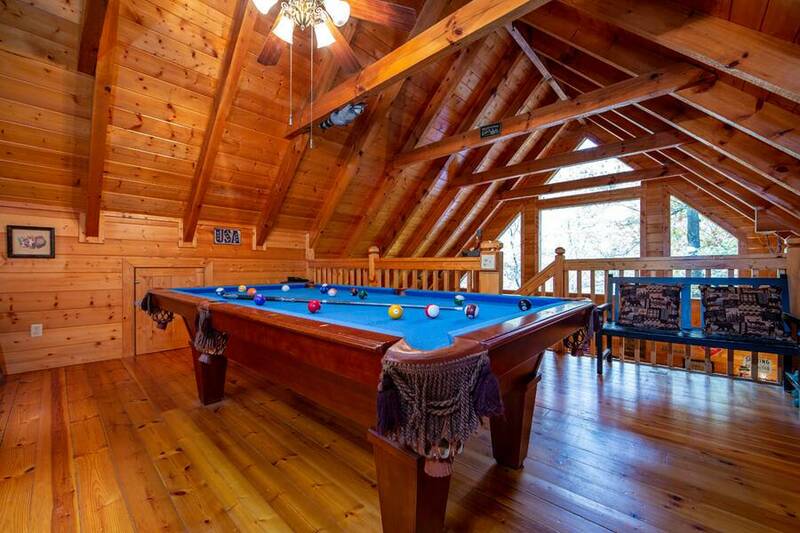 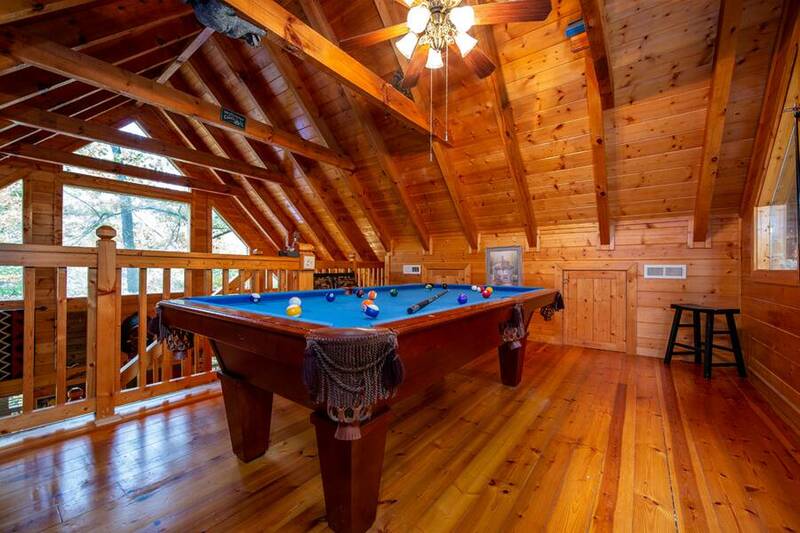 Venture up to the game room loft and play an exciting game of pool. 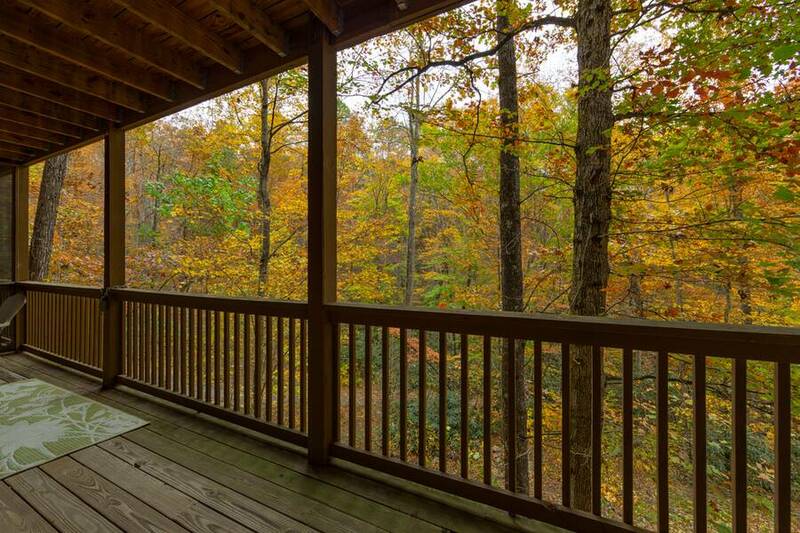 This wonderful space provides additional seating and large picture windows that frame the forest view. 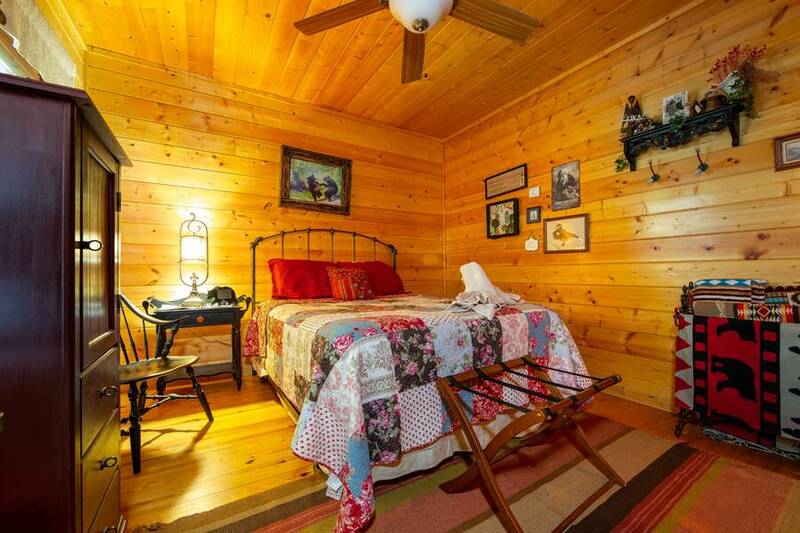 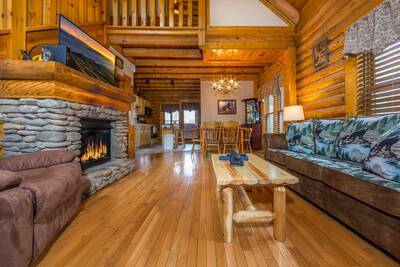 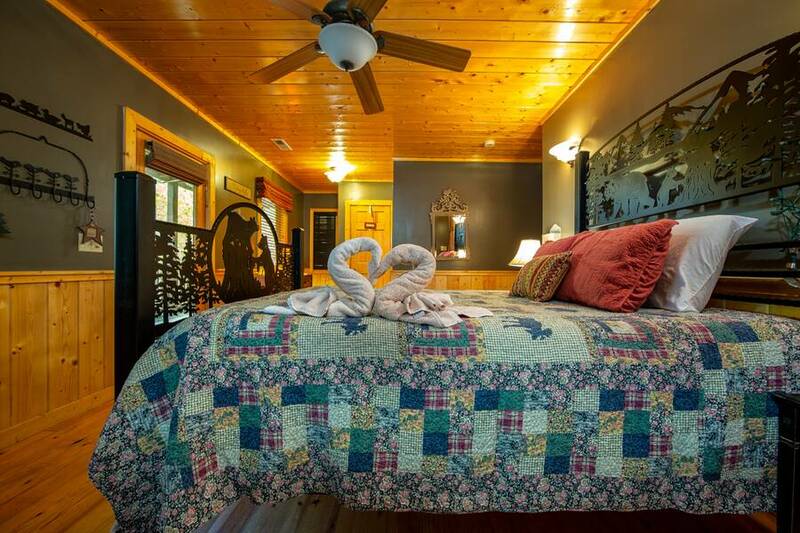 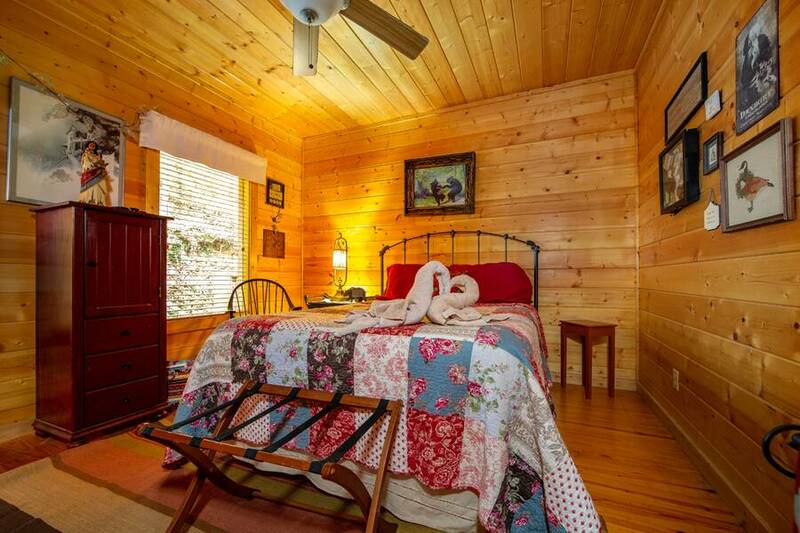 Head downstairs at the log cabin getaway and enter the amazing master suite. 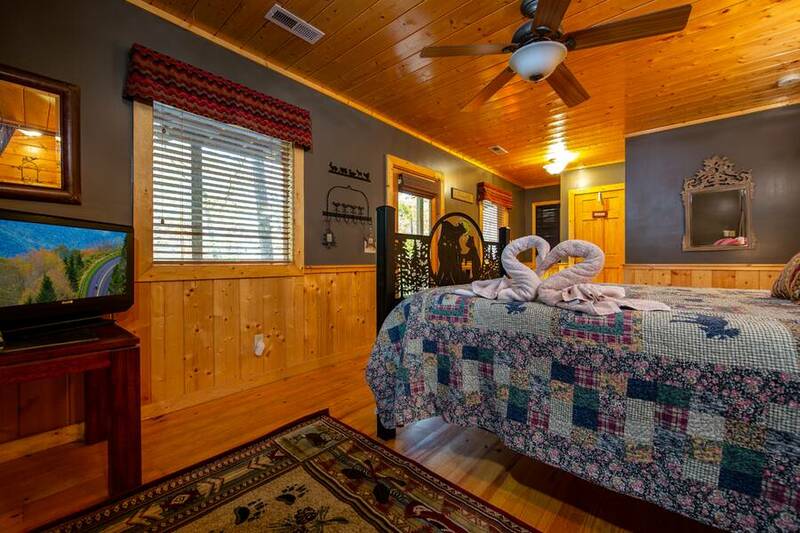 This spacious bedroom is complete with a custom made queen bed, flat screen TV, and ensuite full bath, and access to the lower level covered deck with additional seating and a screened porch where you’ll find the soothing hot tub. 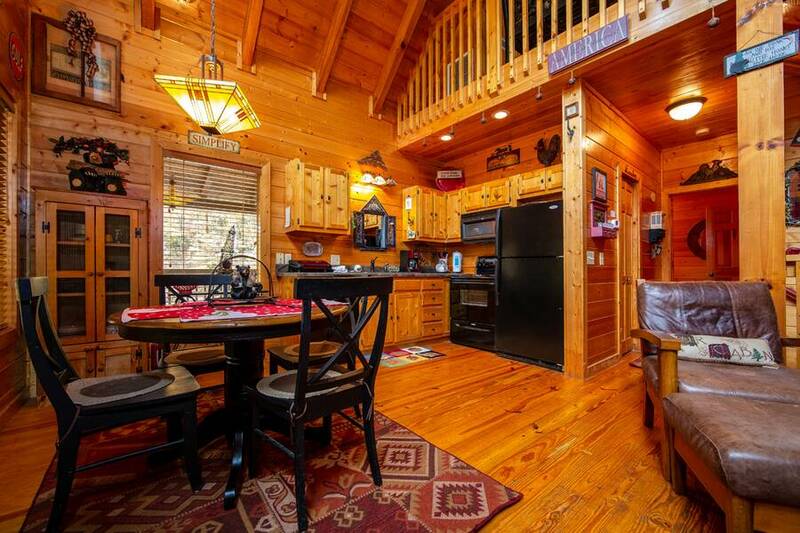 If you’re looking for a remarkable cabin tucked away in the woods that offer peace and tranquility, you have found it here at Luck 7 Bear Lodge! 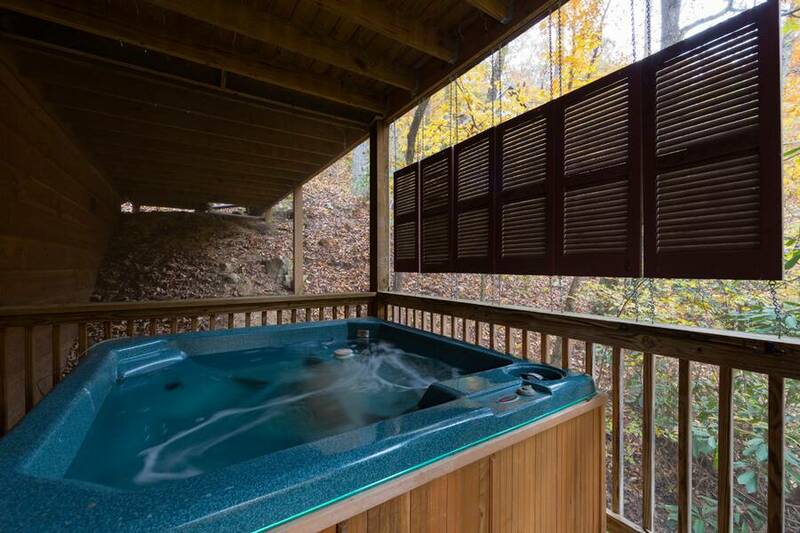 Place your relaxing getaway here today! 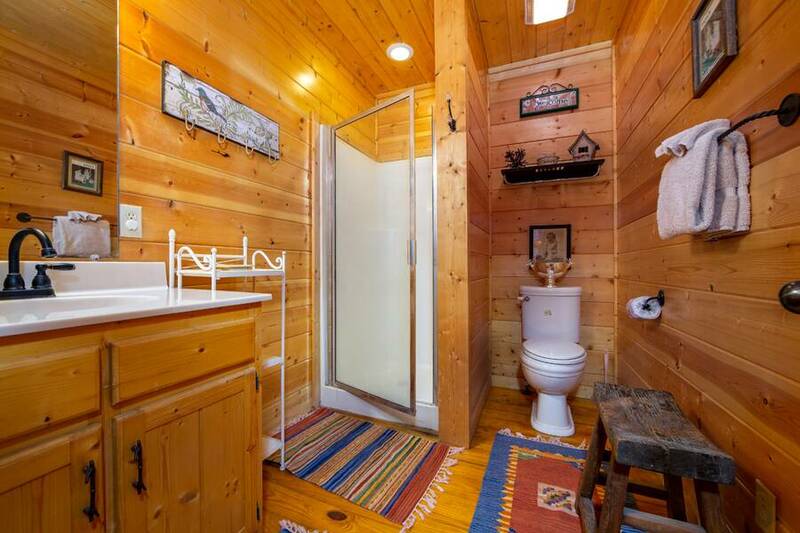 A: Hi Doug! 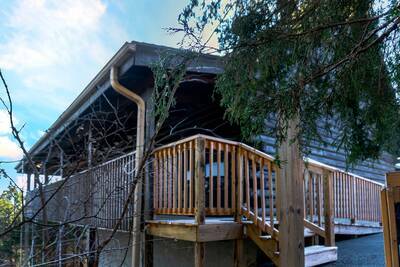 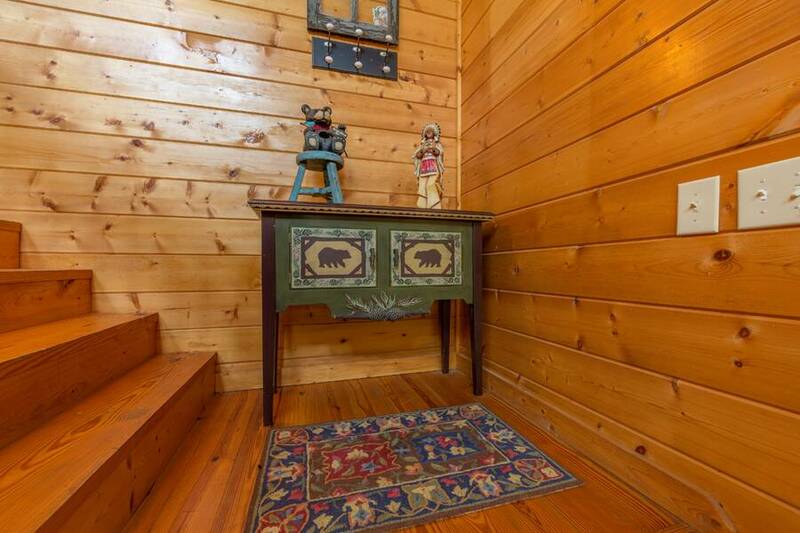 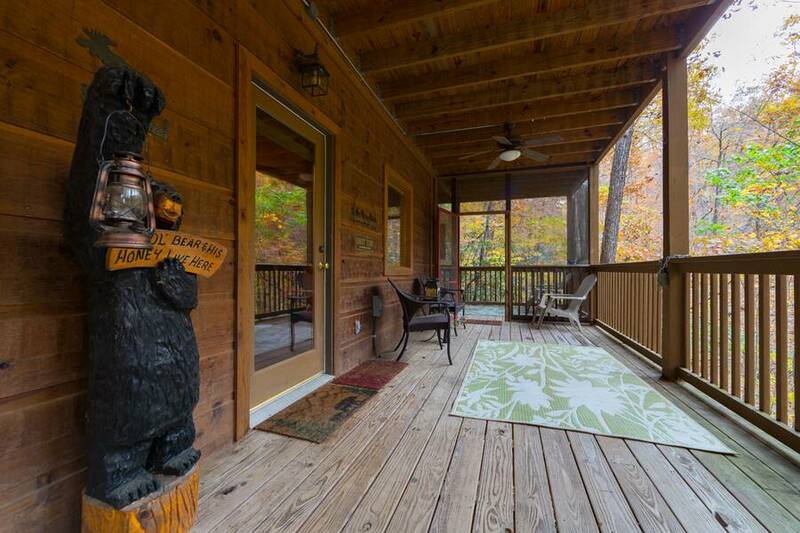 Lucky 7 Bear Lodge is located in beautiful Wears Valley.